Transposon insertion and point mutation independently activated the BoMYB2 gene in three purple cultivars of Brassica oleracea including kale, kohlrabi, and cabbage. Several varieties of B. oleracea have both green and purple cultivars. 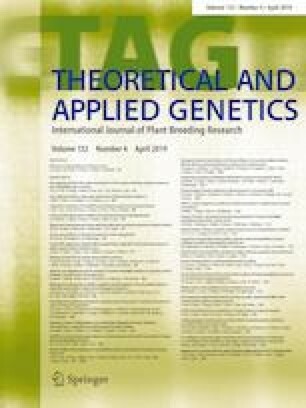 In this study, the causal genes for the purple traits in kale, kohlrabi and cabbage were cloned using map-based cloning approach. The purple traits in all three varieties were mapped to the same locus as the BoMYB2 gene in cauliflower. Surprisingly, the insertion of Harbinger transposon of BoMYB2 in cauliflower was not found in purple kale, kohlrabi and cabbage. Sequencing of the BoMYB2 gene in purple kale and purple kohlrabi discovered a 7606 bp CACTA-like transposon in its promoter region. Transient assay and promoter activity study showed that the insertion upregulated the expression of the BoMYB2 gene. On the other hand, the activation of the BoMYB2 gene in purple cabbage was caused by point mutation and/or 1-bp insertion in its promoter region. Sequence analysis of the BoMYB2 gene in different varieties suggested that the activating events most likely occurred independently after the divergence of cabbage, cauliflower, and kale/kohlrabi. Our results not only contribute to a better understanding of anthocyanin inheritance in B. oleracea, but also provide useful information for future hybrid breeding of purple cultivars through combination of different functional alleles of the BoMYB2 gene. Communicated by Carlos F. Quiros. Chenghuan Yan and Guanghui An have contributed equally to this work. The online version of this article ( https://doi.org/10.1007/s00122-018-3245-9) contains supplementary material, which is available to authorized users. We thank Dr. Xiuxin Deng (Huazhong Agricultural University) for providing the vector of pGreenII0800 and pCAMBIA1301. This work was supported by National Natural Science Foundation of China  and  and the Fundamental Research Funds for the Central Universities [2662015PY084].